Lemon’s complex flavor is like no other. I crave anything citrus so came up with this simple creamy lemon pasta dish. You can substitute rice, farro or other grain for the pasta or just toss the sauce with steamed veggies. 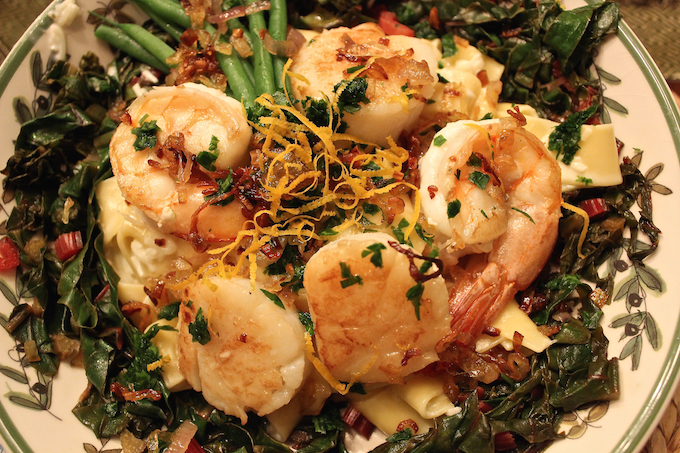 I embellished this dish with sautéed greens from my garden and seared scallops and shrimp. My favorite part is that it’s a one dish meal and looks gorgeous too! Note: EVOO is Extra Virgin Olive Oil. Boil 8 ounces of paparadelle pasta, or any kind of pasta you prefer, until al dente. Do not overcook! Drain pasta, pour back in pan and immediately toss with lemon sauce. Optional: a handful of grated parmesan cheese! Drizzle with Lemon EVOO. Enjoy or make it a meal like I did. I simply sauteed shallots and greens (kale, beet greens, swiss chard) with Lemon EVOO. This was my base for the pasta. Next, I seared a few large sea scallops and shrimp in EVOO mixed with a spoonful of butter. For the grande finale and sprinkling on top, I caramelized thinly sliced shallots that I cooked slowly for about 15 minutes in EVOO. I put this in a bowl, added two teaspoons of lemon zest (I make the long, thin strands), and two tablespoons of chopped, fresh parsley. This delicious mixture is sprinkled over the finished dish and adds so much flavor and color. This recipe, if made like the photo, sounds like many steps but is really very easy!